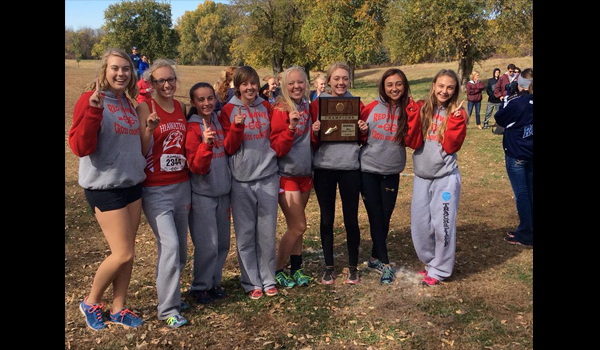 Hiawatha led by Elizabeth Kettler (far right) finished second as a team at 3A cross country. Hiawatha freshman, Elizabeth Kettler, has been named the Rainbow Communications Athlete of the Month from the Northeast Kansas Area from Sports in Kansas for her running performances over the month of October. Kettler won the 3A regional cross country meet at Riley County in a time of 20:53.22 to help advance her team to state. She went on to finish fifth at the 3A state cross country meet at Rim Rock Farm in Lawrence with a time of 20:53.80. Hiawatha finished second as a team with 93 points. Alysun Shamburg finished at 21st place for the Redhawks with a time of 21:27.3. Rounding out the top five for Hiawatha was Emma Williams who finished 33rd, Mary Rosa at 38th and Kailey Davis at 44th. Rainbow Communications and Sports in Kansas will be in partnership to release an athlete of the month from the Northeast Kansas Area at the beginning of the following participation month. To nominate (last 5 days of the month) send email to admin@kansas-sports.com.